The Special Edition set contains the newly-remastered two albums, On Stage 1970 and Elvis In Person with multiple bonus tracks on each disc. The specially-designed double-CD package is encased in the distinctive Legacy Edition mylar slipcase and will be available starting March 23rd. 'On Stage' contains a full-color booklet with numerous photos and a new 3,000-word liner notes essay by Ken Sharp with the backstory. It was at the International Hotel in Las Vegas where - after eight years of non-stop movie making that left no room for live performance tours - Elvis and his manager Colonel Tom Parker finally staged his triumphant return to public concerts in 1969. As if making up for lost time, Elvis unleashed a torrent of pent-up energy at the International, picking up where his black-leather NBC-TV 'comeback' special of December 1968 left off. The International Hotel premiere took place over the course of four memorable weeks in July-August 1969; Elvis returned to the International for another four weeks in January-February 1970. A handful of the 12 songs from the 1969 shows were released in November that year as Elvis In Person at the International Hotel, better known as disc one of the double-LP From Memphis To Vegas - From Vegas to Memphis. The next year, ten songs from the '70 shows were released in June as the album On Stage. Now four decades later, those two albums - with multiple bonus tracks on each - have been coupled together for the first time. On Stage: Legacy Edition pays tribute to Elvis in one of the most outstanding performance periods in his career. The specially-designed double-CD package, encased in the distinctive Legacy Edition mylar slipcase, will be available starting March 23rd. On Stage: Legacy Edition contains a full-color booklet with numerous photos and a new 3,000-word liner notes essay by Ken Sharp that provides the essential backstory. Sharp's recent book, Elvis: Vegas '69, draws on exclusive interviews with the people who were there, including Elvis' TCB bandmates, the Sweet Inspirations, the Imperials, celebrities in attendance, International Hotel personnel including hotel president Alex Shoofey, international media, and many others. 'It was his first live show in eight years and it was a big challenge coming back', master guitarist and TCB bandleader James Burton told Sharp. 'He'd been doing movies for so long and was very insecure about how his fans would accept him. Elvis came up to me right before the show and said, 'James, I'm so nervous, I don't know if I can do this'. I said, 'Elvis, when you walk out there and the curtain goes up, after the first two or three songs it'll be like sitting at home in your living room'. The 1969 shows (represented on disc two) found Elvis asserting his dominion over the formative songs of his career, including '50s hits 'Blue Suede Shoes', 'All Shook Up', 'Hound Dog', 'Heartbreak Hotel', a medley of 'Jailhouse Rock/Don't Be Cruel', and a medley of 'Mystery Train' with Rufus Thomas' 'Tiger Man'. Early '60s hits include 'Are You Lonesome Tonight?' and 'Can't Help Falling In Love'. There were covers of early rock and blues standards from Chuck Berry ('Johnny B. Goode'), Willie Dixon ('My Babe'), Jimmy Reed ('Baby, What You Want Me To Do'), Lowell Fulsom ('Reconsider Baby'), and Ray Charles ('I Got A Woman', 'I Can't Stop Loving You'). Contemporary material was limited to 'In The Ghetto' and 'Suspicious Minds' (both from the Memphis sessions earlier that year), Willie Nelson's 'Funny How Time Slips Away' (a year before Elvis recorded it in 1970), and a surprising cover of the Bee Gees' 'Words' from 1968. Six months later, the repertoire of the 1970 shows (disc one) was entirely different - except for Elvis' red hot version of the blues staple, 'See See Rider' (the opening number) and Little Richard's 'Long Tall Sally', now the material was all from the contemporary song book. This included two songs from the '69 Memphis sessions, 'Don't Cry Daddy' and 'Kentucky Rain'. The emphasis was on ballads, including updates of the Everly Brothers' 1960 hit, 'Let It Be Me', and Ray Peterson's 1959 'The Wonder Of You' (which Elvis chose to issue as a rare live single, and it rose to the Top 10; included here is a bonus afternoon rehearsal version of the song). 'Eschewing the rockier edge of the '69 shows', Sharp writes, 'Elvis broadened his artistic swath, lending evocative interpretations of contemporary material like 'Sweet Caroline' by Neil Diamond, 'Proud Mary' by CCR and Joe South's 'Walk A Mile In My Shoes'. Elvis also applied his personal stamp to Engelbert Humperdink's 'Release Me' and Tony Joe White's 'Polk Salad Annie.' As mentioned, two songs were brought over from the International Hotel recordings of the year before, Del Shannon's 'Runaway' and the Beatles' 'Yesterday'. Four decades later, the impact of these live tracks confirms the fact that Elvis was as much a part of the current pop music scene as any performer of his time and the recordings stand the test of time. 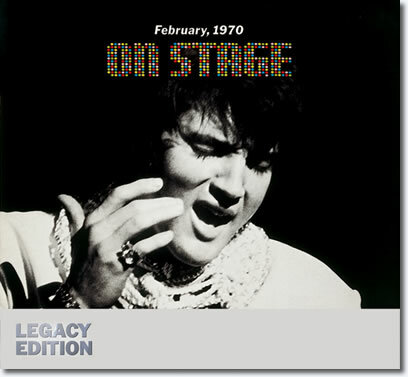 The first disc in the On Stage: Legacy Edition package is a newly-remastered version of Elvis' first live album. The disc's final addition is a unique glimpse of Elvis working on his repertoire, as he runs through 'The Wonder Of You' at an afternoon rehearsal, only hours before the original album recordings were done later that night. • Tracks 1-10 originally issued June 1970, as On Stage, RCA 4362. All tracks 1-13 recorded at dinner shows and midnight shows at the International Hotel, Las Vegas, February 16-19, 1970. Except tracks 4 and 7, recorded August 25, 1969 • Track 14 recorded at afternoon rehearsal, February 18, 1970. Bonus tracks: 13. I Got A Woman • 14. Medley: Jailhouse Rock/Don't Be Cruel • 15. Heartbreak Hotel • 16. Baby, What You Want Me To Do • 17. Reconsider Baby • 18. Funny How Time Slips Away. • (Tracks 1-12 originally issued November 1969, as Elvis In Person at the International Hotel, i.e. disc 1 of original double-LP From Memphis To Vegas - From Vegas to Memphis, RCA 6020; re-issued November 1970 as single-LP Elvis In Person, RCA 4428). All tracks 1-18 recorded at dinner shows and midnight shows at the International Hotel, Las Vegas, August 23-26, 1969. • Tracks 13-16 originally issued 2008, on Elvis In Person (Follow That Dream Music, 88697 40721 2) • Track 17-18 originally issued on Collectors Gold (RCA 3114). This 2-CD set is a potent reminder that Elvis was enjoying one of many career peaks during these engagements in Las Vegas. During the August 1969 shows that yielded In Person, the artist prowled the stage like a panther and shocked audiences with his full-throttle intensity. Conceived similarly to his '68 Comeback Special, these tracks capture Elvis doing what he did best, but now with a full band and an hour-long setlist.